Petit Basset Griffon Vendeens - Hardy, Loyal and Irrestible Little Dogs. Intelligent, Alert and Super Cute! 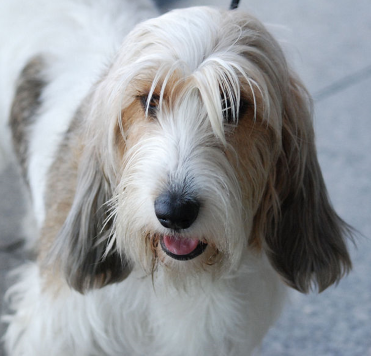 The origins of the Petit Basset Griffon Vendeens (also referred to as PBGV or Petits) are to be found in the larger version of the Griffon which dates back to 16th century France. Not surprisingly, a few of these little Frenchies at some point found their way into the royal household of King Louis XII. The PBGV is part of the AKC hound group and is referred to as a scent hound. It has been used primarily to hunt hare, fox and deer, which it does very capably with great speed and much enthusiasm. Equipped with a tough coat, small body and a hardy constitution, the breed is well suited for hunting in the rugged terrain on the west coast of France. The small and charming appearance of the Petit can be deceptive, but make no mistake, this is a tough, confident and purpose-driven little dog. The Petit Basset Griffon Vendeens are the epitome of the shaggy dog look. Their tousled coat, floppy long ears, old-fashioned moustache and beard together with long eyebrows finish off the irresistible expression and a face that can't be ignored! However, these charming features are not just for show, they did have the important purpose during hunting of providing protection to the Petit's face while forging through rough terrain and brambles. The rough textured coat which is up to 2-l/2 inches long needs a thorough brushing at least once a week, if not more, to take care of tangles and remove shed hair within the coat. A high quality pin brush will do the job without damaging the coat. If you need to do any de-matting, this slicker brush is the ideal tool along with the right comb. Both of these will make it so much easier and gentler on your dog. The tools I recommend are of show quality because that is what is needed to keep this beautiful coat in good condition without damage. Cheap tools will take their toll on it over time. 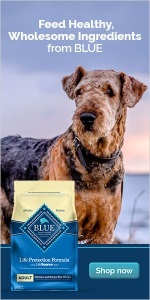 Petit Basset Griffon Vendeens are long-eared dogs which need frequent inspection to look for any signs of ear mites or other parasites that could cause infection, as well as excessive wax build-up. Naturally any necessary ear cleaning of this area can be done at the same time. As with all dogs, teeth should be cleaned weekly or daily if possible. You can watch a "how to" video on this page of the website and see how to clean your a dog's teeth as well as some helpful products to get the job done. Nails should be clipped whenever you hear a clicking sound as the dog walks accross a hard surface. If you find this a difficult chore with dog nail trimmers, try a dremel which is easier and less traumatic. Petit Basset Griffon Vendeens are friendly dogs with a cheerful and jaunty personality. They are very smart and people oriented. As with most intelligent dogs, they can be willful, so be forewarned! Establish your leadership early on if you don't want them to rule the roost. Having said that, they like to please, are known to be devoted and loyal to their owners, and love being the center of attention in family life. Training them for obedience with a gentle and patient hand works best. If you'd like your PBVG to be involved in competition, they have done well in trials for tracking and agility. Petits have also been involved in search and rescue and some used as therapy dogs. PBGVs generally get along well with most other pets in the household - except rabbits might be a challenge! Petit Basset Griffon Vendeens are very active little dogs with lots of stamina. Because they both enjoy and need a lot of exercise, it is important that this not be overlooked. Without sufficient physical activity, they will become restless and bored which can lead to undesirable or destructive behavior. House or apartment will meet their needs. Apartment dwellers should be aware that PBGVs can be barkers and need to learn the quiet commands early on. They like to explore and are curious so best keep your treasures put away. 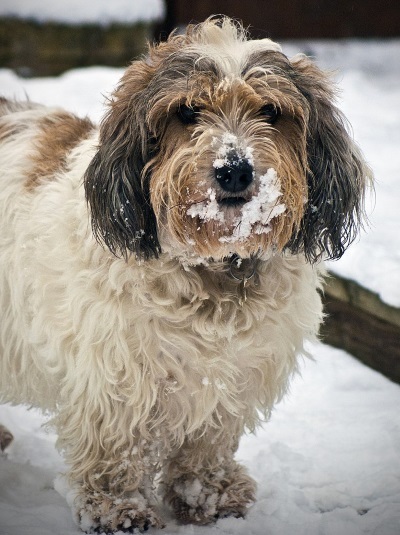 Outside areas should be secure as PBGVs are good at jumping and tunneling - as in digging. Their strong hunting instincts make them prone to escape tactics if something interesting gets their attention. Is the PBGV Good With Children? Petits make good family dogs that love attention. They have a gentle nature and a reputation for getting along well with children and adults. Other pets in the family are usually well-accepted too. One thing to consider is that the PBGV is quite a bold and active fellow and may be a bit too boisterous of a playmate for very young children. The caution remains that no matter what the breed of dog, an adult should oversee any activities between children and pets. Petit Basset Griffon Vendeens like lots of attention which can make them excellent companion dogs for active retirees. The important caveat is that their exercise needs must be met to avoid bordeom and undesirable behavior. If you are a more sedentry family this may not be the ideal pup for you. However, if you love the breed and can make arrangements for your pet to get sufficient daily walks, you are good to go. A very well-researched study of the Petit Basset Griffon Vendeen and its hunting background. A valuable resource for owners and an indispensable guide to those wishing to acquire this breed of dog. In addition to learning about the characteristics and rearing of the breed, the book contains significant historical information as well as a collection of rare old pictures. Covers breed history and characteristics, puppy selection, feeding, training, health care and behavior. Also includes advice about preparing for the puppy, housetraining and handling puppy problems.